I am excited for Easter weekend because my dad (kids grandpa) is coming to town. He will actually get to read it and enjoy it with my kids! I know they will find it extra special to have their papa read it to them. Each new page is a different animal doing a different activity with their grandpa. 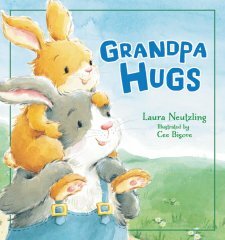 It truly is a fun book for any grandpa and his grandchild to read together! This board book is sure to give kids and their grandpa some fun ideas to do with their grandkids from fishing to funny sayings to jokes, and of course HUGS! I will keep you posted if my dad acts out anything while reading this book because I could see that happening too! This book is geared for kids aged 2-4 but even older kids can enjoy it! The pictures are adorable and the price is very fair at $9.99! Thanks, Booklook program for sending me this book free of charge in exchange for an honest review. I was not paid for this review and all opinions expressed are 100% mine.